A man accused of shooting two police officers and a woman during to a domestic dispute on Elm Street in New Haven, prompting a SWAT response and evacuations in the neighborhood Saturday, is in custody, according to the police chief. The shooting occurred on Elm Street between Orchard Street and Sherman Avenue around 10:30 a.m.
New Haven Police Chief Anthony Campbell said that the officers were injured during a response to a domestic incident. Police believe a man shot his wife. New Haven Police spokesman Officer David Hartman said that the 51-year-old female victim was shot several times at a home at 638 Elm Street then ran to a neighbor’s home for help. The victim was shot in the hand, arm, back and chest and she was taken to Yale-New Haven Hospital for treatment where she was in critical condition. She is now in stable condition. Police said the victim is a retired Department of Correction officer. When officers entered the home at 638 Elm Street, shots were fired. The officers, identified as Officer Eric Pessino and Officer Scott Shumway, suffered non-life threatening injuries. Pessino suffered a graze wound on the arm and has been treated and released. Shumway was shot in the arm and was released Saturday night. Both are at home recovering, police said. 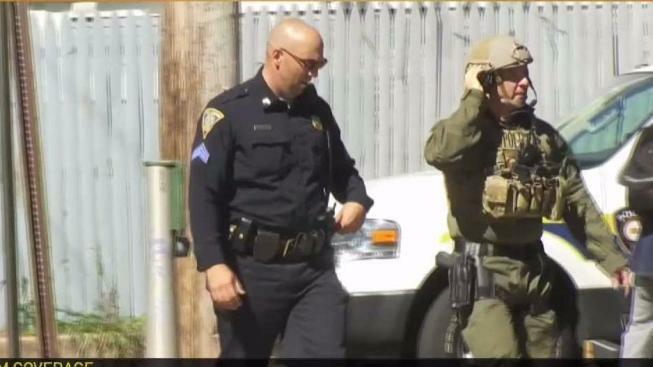 The SWAT team and hostage negotiators were called in. Negotiators attempted to convince the suspect to surrender but were unsuccessful. The suspect was taken into custody after police confronted him by the basement of his home. According to police, the suspect pointed a gun at law enforcement officers, who fired at him. The suspect, identified as 51-year-old John Douglas Monroe, was taken to Yale-New Haven Hospital with serious injuries. Monroe is expected to face a long list of charges. Neighboring buildings were evacuated and the road was closed down for several hours. As of 3:15 p.m., people were being allowed back into their homes. Connecticut State Police and the New Haven State’s Attorneys Office have taken over the investigation. "I'm so grateful the two officers shot in the line of duty today weren't wounded more seriously, and seem to be OK; likewise, I'm grateful for the effective, professional response by the NHPD in the face of today's violence. All of us in New Haven appreciate the potential risk police officers face daily - and thank them for taking on that responsibility."